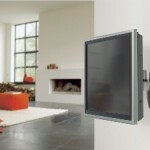 Flat to the wall / 23-37″ Screen / up to 45 kg / Distance to the wall 59 mm / Up to VESA200x200. 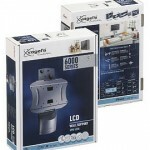 Turn 40° + Tilt 30° / 23-37″ Screen / up to 35 kg / Min. (Max) distance to the wall 94 mm (160 mm) / Up to VESA200x200. Pull out the EFW 6225 support and turn and tilt your screen to get the best view. Afterwards, simply fold the screen back against the wall. And you can combine this wall support with our Column system and Audio/DVD support to create your own entertainment centre. Note : Some retailers still sell this particular model wall support in the 2007 packaging. The 2007 packaging indicates a smaller maximum screen size compatibility and/or a lower maximum screen weight compared to the specifications on this website. Do not worry, the supports in this older packaging are also suitable for the higher maximum screen sizes and weights as indicated on this website. Turn 40° & Tilt 30° / 31-50” approx / Max. weight 45 kg / Min (Max) distance to the wall: 98 mm (213 mm). Note bracket only included for this price – optional extras available (accessory shelf and column system, as per image) – please contact us directly for special quote. 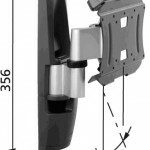 1 Vogels PMC115 mount for attaching to rear of carseat (use in conjunction with Vogel’s basecover) – basecover to be purchased separately. For those on the move, Vogel’s has adapted its successful DVDock to create the Car Mount, part of the Mount & Cover System. No tools are needed to connect a Car Mount, which is securely fixed to the front seat headrest. The iPad plus Base Cover is then simply clicked into place for each journey. Now back seat travellers can enjoy all their content on the iPad whilst on the move. All in one Docking station (suitable for PS original + PS slim), hides your cables neatly, continually charges controllers. Peripheral equipment is always connected. Provides 4 extra integrated USB ports with data & charging function. Specifically designed for the PS3. High quality & styled to match the PS3 perfectly. 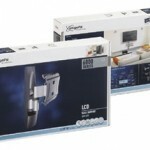 THESE 3 COMPONENTS FOR 1 GREAT PRICE! 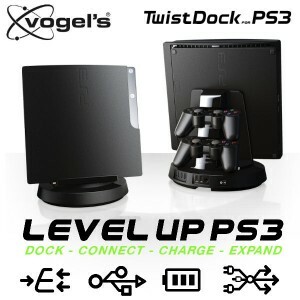 TwistDock is much more than a standard docking station for this popular gaming system. This unique system expands, charges and connects to the Sony Playstation 3, while keeping cables neatly out of sight. 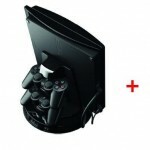 It is a docking system that fits both the Original and Slim versions of the PS3 gaming console. There is nothing more frustrating than having to stop a game halfway through to re-charge the controller’s batteries. Now gamers can just keep on playing. With TwistDock, the controllers are always ready for action. Even when the console is turned off, the controllers can be charging. Gamers can easily snap two controllers into place on the back of TwistDock’s turning tower. So they are always charged and ready to go in the blink of an eye. No more digging through the couch cushions to find lost controllers. TwistDock gives the PlayStation the place of honor it deserves in the home. In many homes, the PlayStation gaming console has become a set fixture. Especially since it is much more than just a gaming computer. It is a complete media center with internet, on-demand television and a blu-ray/3D player that stands next to the flat screen TV in many cases. But like so many other pieces of entertainment equipment, the PlayStation also comes with its own stack of cables that can be a real eye-sore to look at and a mess to keep tidy. With TwistDock, these cables are neatly concealed in the sturdy pedestal that holds the PlayStation securely in place. TwistDock can be expanded with two extra accessories, the TwistDock CableSet and TwistDock USB HUB. 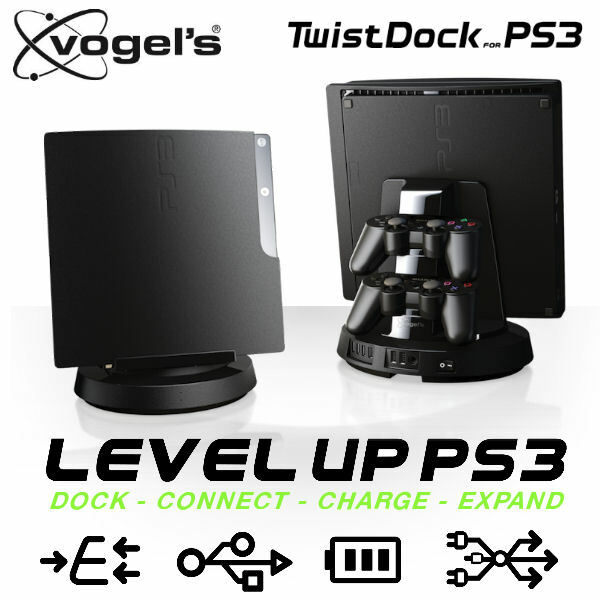 The TwistDock CableSet adds an extra set of high quality cables to the TwistDock that are designed to fit seamlessly with the sleek look of the PS3. With TwistDock’s integrated USB HUB, four extra USB ports can be connected to the TwistDock and used for charging and data storage. This HUB is useful for connecting an extra hard disk or other accessories to the gaming console. During Retail Vision 2010 in London, TwistDock was officially introduced to sales channels. It was immediately a big success. During this trade show, TwistDock immediately carried off the prestigious RetailVision Europe 2010 Award. TwistDock was honored in the “Best Accessory” category. Experience the best view anywhere in the room with the THIN 225 UltraThin LED/LCD/Plasma wall mount. Use it in your bedroom, living room, children’s room and kitchen for the ultimate viewing flexibility. This wall mount easily turns your TV up to 120 degrees (60 degrees left and 60 degrees right) and tilts your screen up to 20 degrees forward so that everyone can easily watch TV. This mount is part of the Vogel’s TURN products. Enjoy your morning news show or afternoon food program in the kitchen by adjusting your LED/LCD/Plasma TV to the best view, wherever you are working. Watch a game while working on paperwork or enjoy a movie with friends by turning your flat screen TV to the perfect position. 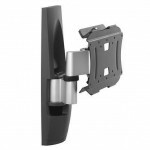 You hardly see this wall mount with just 3.5 cm (1.4 inch) of space between the TV and the wall. It only takes a moment to install the LED/LCD/Plasma wall mount with the easy level adjustment and drilling template. Suitable for screen sizes of 26 to 42 inch (66 to 107 cm) with a maximum screen thickness of 4.5 cm (1.8 inch). 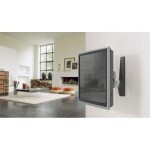 Turn your flat screen TV to the best view anywhere in the room with the WALL 1125 LED/LCD/Plasma wall mount. Ideal for mounting a flat screen TV in your bedroom, kitchen, workspace and children’s room. This flexible wall mount turns your TV up to 120 degrees (60 degrees left and 60 degrees right) and tilts your screen 10 degrees forwards and backwards so you always get a great view. This mount is part of the Vogel’s TURN products. Now you can mount a LED/LCD/Plasma TV anywhere on your bedroom wall and still get a great view. Great idea for the kitchen where everyone seems to gather. It lets you mount a flat screen TV in the most crowded children’s room. 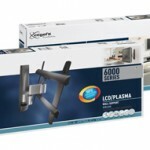 Or you can use this flexible LED/LCD/Plasma wall mount to put your flat screen TV up in a workspace. When you are doing paperwork or exercising, you can watch your favourite show. Turn the screen to the right and left and tilt it forward and backward so you always have a great view. Cables are easily guided to prevent damage. 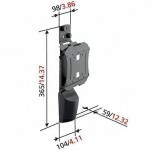 This wall mount comes in black and silver and is suitable for screen sizes of 19 to 37 inch (48 to 94 cm). It supports up to 15 kg. Enjoy the best view anywhere in the room with the WALL 1025 LED/LCD wall mount for your flat screen TV. It turns your TV up to 120 degrees (60 degrees left and 60 degrees right) and tilts your screen 10 degrees forwards and backwards for extra viewing flexibility. Ideal for mounting a flat screen TV in your kitchen, workspace and children’s room. This mount is part of the Vogel’s TURN products. Great way to enjoy your favourite shows in the kitchen no matter what you are doing. 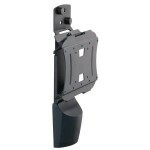 Use this flexible LED/LCD wall mount to put your flat screen TV up in a workspace. Do a workout, your favourite hobby or catch up on some paperwork while watching TV. Or mount a flat screen TV in your children’s room to keep them entertained. Turn the screen to the right and left and tilt it forward and backward so you always have a great view. Cables are easily guided to prevent damage. 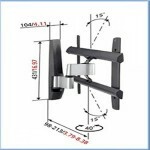 This wall mount comes in black and silver and is suitable for screen sizes of 17 to 26 inch (43 to 66 cm). It supports up to 15 kg.